Memorial Day weekend kicks off the official start of grilling season. It also kicks off cut off shorts season and burn until you look like a lobster season. It’s a season of magic. In my efforts for making your drinking experiences more efficient this summer, I will have a bunch of upcoming recipes that are batched for your convenience. Take 10 minutes the night before, or first thing in the morning, to put together the bases, and then top off as needed day of. Easy. First up is a drink I made for Serious Eats (guys, drinks is no longer its own site, it’s incorporated into just one big Eats site now, so don’t get confused) where I use BEER as the alcohol base. Yes, yet another beer cocktail on this site for the year. It is the topper for a spicy, smoky sangrita-like base that you can make ahead of time. Sangrita-like might be stretching it; it’s really just sangrita made with a bunch of delicious citrus with a dollop of harissa. Not familiar with harissa? If you like spice and smoke you’ll like this peppery paste that has its roots in North African cuisine. It’s not normally used in drinks, but I love the extra level of spice it adds. Also, a little goes a long way, so you can keep it around to experiment with food later. Usually, sangrita is just the sidekick to a shot of tequila, but I love the rich flavors of tomato and citrus so much I thought it deserved its own spot at the bar (or backyard BBQ) as a cocktail. Since it’s a low alcohol drink, you could easily sip on these all afternoon, playing horseshoes or whatever it is people do outside. To make the base, in a pitcher, whisk together harissa, black pepper and tomato juice. Add grapefruit juice, orange juice, lemon and lime juice. Stir to combine. Refrigerate for at least 2 hours, or up to 8 hours maximum. To make the cocktail, wet the rim of a highball glass with grapefruit wedge, dip moistened edge in smoked sea salt. Add ice and 4 ounces of the sangrita base. Top with 4 ounces of IPA. 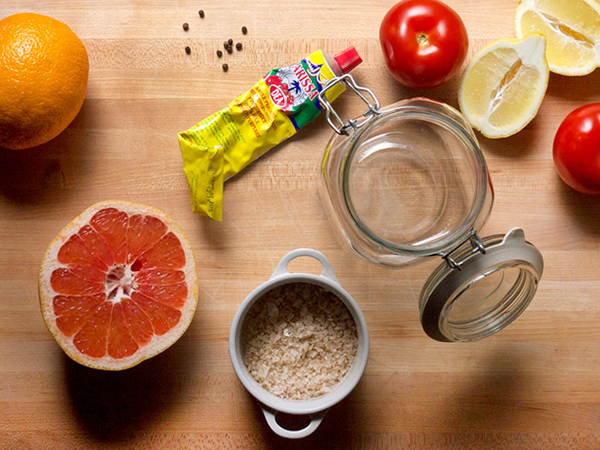 Garnish with grapefruit wedge and serve. Citrus is an ideal match for a hoppy IPA. The Sculpin IPA from Ballast imparts a lot of grapefruit and lemon in the flavor, as well as in the aroma, which not only compliments the tomato-citrus base, but also adds some needed bitterness to round out the drink. With beer cocktails, the effervescent quality will significantly lift a heavier based drink which can sometimes seem like a challenge to drink. It can also provide a smoother, creamy texture, making the drink feel more like a “cocktail” and less like juice (or in this case Gazpacho). 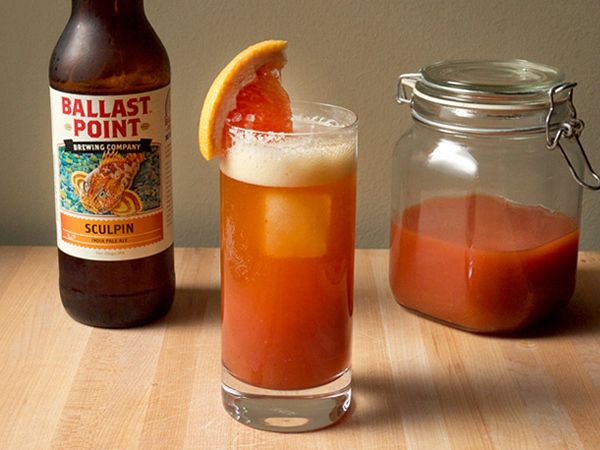 If the Sculpin is not available in your area, look for a beer with this kind of citrus profile. And at the end of the day, if you run out of the base, this beer pairs excellently with barbecue too. At some point over the last few years I scribbled down the name ‘roses in the snow’ in my notebook. I had a name but only a rough idea for a drink; this happens a lot. Then when I had to come up with some drinks for February over on the Serious Drinks site, I figured this was a good time to dust off the name and develop that idea into a real cocktail. I love the smell of roses. They remind me of summers in New England and they’re also my birth flower, so I feel like I have an even bigger connection to them, even if it’s made up (who came up with the idea of birth flowers anyway…). Roses in the Snow is a take on a gin fizz and you can read more about that and hydrosols over on the Serious Drinks post. 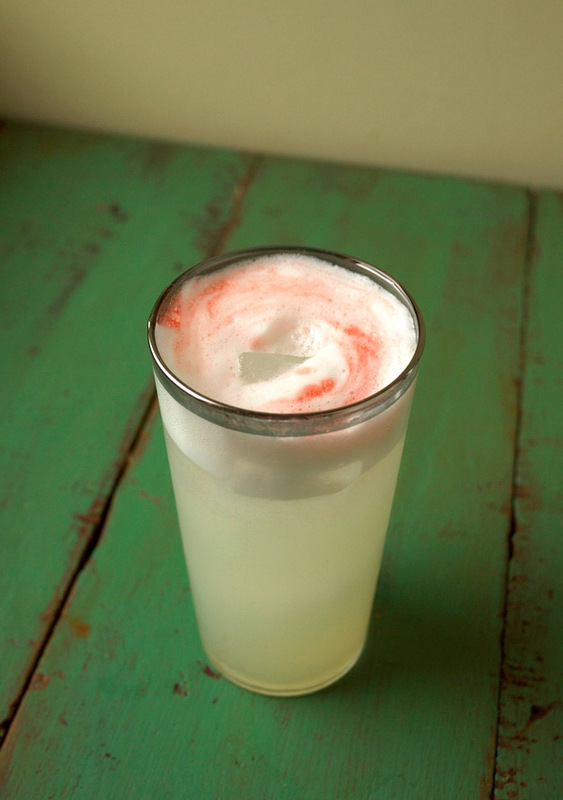 Add gin, lemon, simple syrup, rosewater, and eggwhite to a cocktail shaker. Dry shake (without ice) to incorporate eggwhite, about 30 seconds. Fill shaker with ice and shake until frothy, about 30 seconds longer. 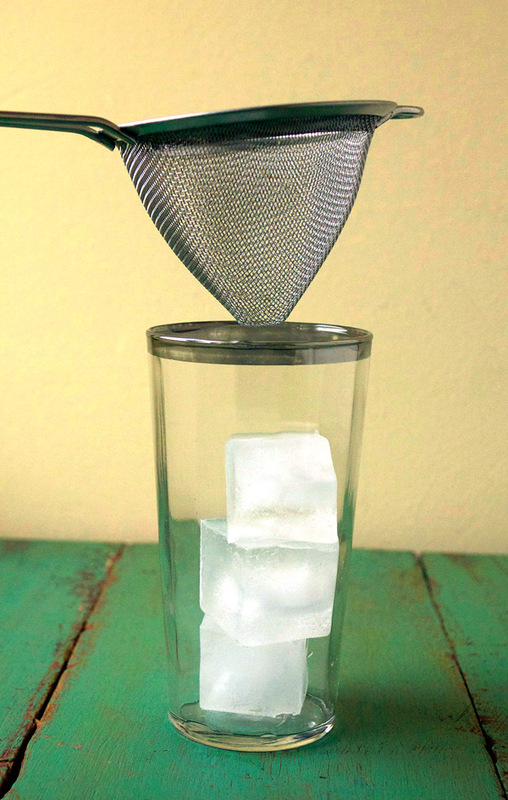 Double strain by pouring through a bar strainer into a fine-mesh or conical strainer set in a highball glass filled with ice. Top drink with club soda and bitters. Gently stir and serve. There’s a lovely hint of roses without being becoming too perfume-y, and the usual sweet-tartness found in a gin fizz. It’s also pretty to look at too.